Prestige Fans have just released the Hugger range of Atlas Irene fans to compliment their ever popular and growing range of fans from the Matthews Fan Company from the USA. 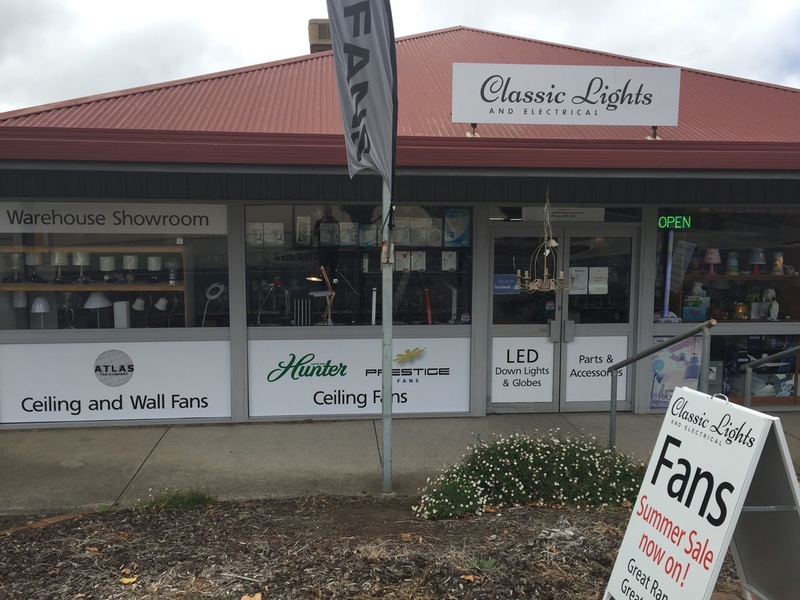 Classic Lights & Electrical in Mount Barker SA recently had a makeover, with new signage added to the front windows. This served two purposes, one to promote the great brands they have like Atlas and Hunter fans from Prestige Fans, and secondly to keep the shop cooler from the hot afternoon sun. We think it looks great! ​Prestige Fans, the distributor for the Hunter and Atlas brands of ceiling and wall fans in Australia now have their fans displayed in over 100 stores Australia wide. ​In the beautiful township of Byron Bay, the Byron Fresh Cafe have installed a combination of Atlas Melody and Diane fans to keep both their patrons and customers cool whilst enjoying the atmosphere of the cafe. While ceiling fans are a popular way to beat the heat, they are often an eyesore in homes across the country. Here is how someone personalised their light kit with a simple DIY modification. 21/1/2014 We would like to welcome our latest Stockist - Limestone Coast Lighting Solutions. They have two stores, one in Mount Gambier and another in Naracoorte, and are in the process of refitting both showrooms, where they will put a number of Hunter fans on display, so please drop in and see what they have. click on the "Where to Buy" tab on this website.